The most characteristic feature of Varanus salvadorii is its blunt, bulbous snout, which makes this species look different from every other monitor lizard and lends to its common name of tree crocodile. The body of Varanus salvadorii is dark green with rings of yellow spots. The tail is banded yellow and black and is extremely long, being more than twice as long as the snout-to-vent length. 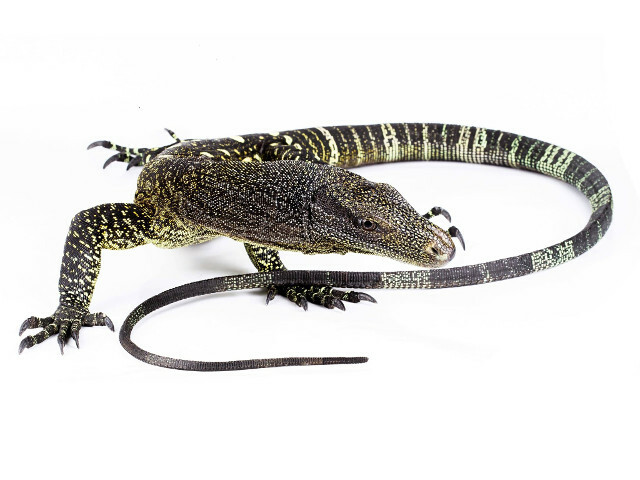 Varanus salvadorii has long, straight teeth and prominent, curved claws. The size of the enclosure should be 2.40 x 2.40 by 2.40 meters (8 x 8 x 8 feet) for a single average sized adult. Strong well fixed branches/logs are recommended as we are speaking for an arboreal species. Climbable walls, this can be provided by mesh fixed to the walls, bark panels, strong faux backgrounds. Shelf’s or logs placed high up within the enclosure is a must for these. Basking site needs to be up high within the enclosure and provide enough space for the whole SVL of the monitor in order for correct basking to be achieved. They really enjoy looking down on you from high up, this in turn makes for a calmer salvadorii when you approach the enclosure. Little to no air vents in the enclosure will help with the heat and humidity side of there requirements. Hides need to be provided both up high and low down but are seldom used as they mature. Recommended substrate is a soil, bark, coco coir and sand mix (Bio Active). Providing a minimum of 0.3 meters (1 foot) substrate will really help in keeping the humidity levels up, 1-1.2 meters (3-4 feet) ideally for nesting success I suspect. The basking spot should range from 55–80 ºC (130-175 ºF) with 70 ºC (160 ºF) as ideal. A proposed way to achieve this is 2 x 100w par30 FL and 1 x 70w metal halide UV reptile bulb spaced 0.2 meters (0.6 feet) apart. Make sure that the basking spot can cover all the body of the lizard. Placing three or four lamps in a row can achieve this instead of one big lamp.The ambient temperature in the enclosure should be 25–38 ºC (77-100 ºF) with 30 ºC (86 ºF) as ideal. Fresh water provided in a clean bowl daily. They seldom drink from a water dish unless it’s clean fresh water often if they don’t touch it within two hours of you changing it they likely will not that day. Most enjoy a good misting and once accustomed to it they readily drink the mist spray as your misting them. The humidity level should be high as we are talking about a rain forest enclosure. It should be between 70% – 95% with 85% as ideal. Deep substrate & misting every few days supports this level of humidity. Prey items readily taken by my animals: mice, rats, chicks, quails, rabbits, chickens, herring, sprats, Prey items start of small while young e.g. fuzzies, rat pups cut up chicks and other items. I personally found no interest was shown in insects or other reptiles. As a hatchling feed daily, juvenile feed every other day and as an adult feed twice. I supplement on every feed with Repashy calcium plus with a tiny sprinkle on each item. to give you a idea of amount per animal a 1 meter (3 feet) juvenile would often consume 4 chicks, 2 mice and 2 roach fish TWICE a week moving onto 6 chicks 3 mice and 2 fish at around 1.5 meters (5 feet) but lowing to a rat, 2 chicks and fish as a full grown NON breeding male to maintain correct body weight. Try not to handle these animals. You need a lot of patience and time to tame them and even then they can provoke damage. They are big animals with claws and very sharp teeth. You need to show them the respect they deserve. Change their water bowl daily as they rarely drink water that’s even a few hours old. By using the bio-active substrate the enclosure is conditioned by the living organisms in the soil so you are having a clean enclosure all the time. Varanus salvadorii will usually shed in pieces. If you provide the proper humidity there are usually no problems. Health problems are the same as most lizards. Parasites, poor skin shed due to poor humidity and injuries that might come as a result of the breeding process.